Movies Like Clueless: Romantic Comedies '+g+"
Like watching romantic comedy movies like Clueless (1995)? 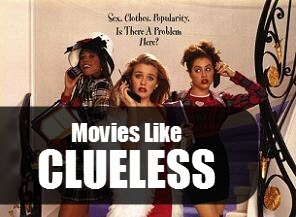 then check our list of recommendations for movies similar to Clueless. It is a 1995 romantic comedy movie directed by Amy Heckerling and is loosely based on Jane Austen's 1815 novel Emma. The story follows superficial, wealthy, Beverly Hills teen Cher Horowitz's (Alicia Silverstone) ups and downs of adolescent life. Don't forget to mention if we miss any other movies like Clueless as we keep on updating this list. 10 Things I Hate About You is a teen romantic comedy based on 'Taming of the Shrew" by William Shakespeare. The story follows Cameron James who must find a date for his girl friends un-dateable older sister as he cannot go on a date until she finds one. Legally Blonde is a 2001 romantic comedy movie directed by Robert Luketic. The story follows a California sorority girl Elle Woods (Reese Witherspoon) who tries to win back her ex-boyfriend by following him to Harvard Law School and earning a law degree. She's All That is a 1999 teen romantic comedy movie directed by Robert Iscove. The story follows school's popular guy Zack Siler (Freddie Prinze Jr.) who makes a bet with his friends that he can turn the school's biggest geek, Laney Boggs (Rachael Leigh Cook) into school's prom queen within five weeks. However he never knew he is going to falls in love with her. Emma is a 1996 romantic comedy drama based on the novel of the same name by Jane Austen. Set in early-19th-century England the story follows a mischievous young matchmaker Emma Woodhouse (Gwyneth Paltrow) who attempts to find a match for her friend Harriet (Toni Collette). Sixteen Candles (1984),.....if you can think of more, then don't forget to mention it in comments.